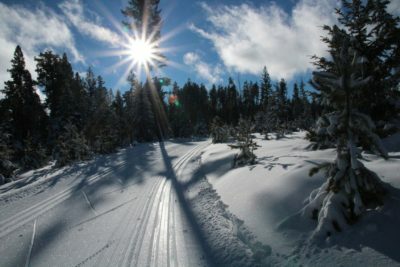 If you’re still in Kamloops by the time the end-of-semester break rolls around and are wondering what to do with your time, why not try nordic skiing or snowshoeing? Nordic skiing, or cross-country skiing as it is also known, is an excellent way to relieve some of that exam-period stress, says Vesta Giles, president of the Overlander Ski Club. The sport itself doesn’t quite have the learning curve of alpine, or downhill, skiing either, says Giles. However, if you’re not sold on skiing around Stake Lake’s 60 km of ski trails, you can also try out snowshoeing. For those who don’t have their own gear or maybe want to switch out their skis for snowshoes, the club even rents equipment. The prices for club memberships are pretty reasonable as well. Early Bird season memberships for TRU students, which run until Nov. 15 are $72. After that, the price is bumped up to $82. Day passes are also available for students at $7 per day. Giles adds the 30 year-old club is constantly growing and now has around 700 members. As such, they are always looking for experienced skiers to come volunteer. However, Giles stresses that the greatest opportunity at Stake Lake, is the chance to get out and enjoy the fresh winter air in a place that is stunningly beautiful. Who knows, you might even see some wildlife on the trails. If you interested in checking out the Stake Lake trails or even volunteering, you can contact the Overlander Ski Club at (250) 372-5514 or info@overlanderskiclub.com.